Eldad Tarmu is currently a professor of Jazz Studies in Tibiscus University in Timisoara, Romania. He holds a Masters degree in Afro-Latin Music from California State University Los Angeles and, as a leader, has recorded and toured on seven CDs, performing in over twenty-five countries around the world. Along the way, Eldad has played with some of the best musicians and performers in their genres, including: Taj Mahal, Freddie Hubbard, Billy Higgins, Jeff Hamilton, Joe LaBarbera, Poncho Sanchez, Ernie Watts, Frank Morgan, and even actress Cybill Shepherd. 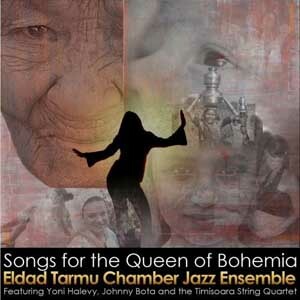 The Eldad Tarmu Chamber Jazz Ensemble is proud to announce the release of their new CD project, Songs for the Queen of Bohemia, featuring The Tabac String Quartet. Led by the critically acclaimed vibraphonist, composer Eldad Tarmu, Songs For The Queen Of Bohemia features an ensemble of bass, drums, vibes and string quartet. It's melodic approach and unique timbres come together in an exciting way. "Tarmu is a sensitive soloist, and the album, with its mix of jazz, balcanic perfumes and chamber music, is a find for listeners in search of a music that defies barriers." - Vincenzo Roggero, All About Jazz: Italy The Eldad Tarmu Chamber Jazz Ensemble is proud to announce the release of their new CD project, Songs for the Queen of Bohemia, featuring The Tabac String Quartet. 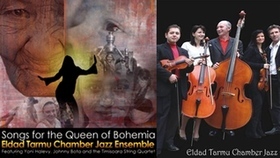 Led by the critically acclaimed vibraphonist, composer Eldad Tarmu, "Songs For The Queen Of Bohemia" features an ensemble of bass, drums, vibes and string quartet. It's melodic approach and unique timbres come together in an exciting way.